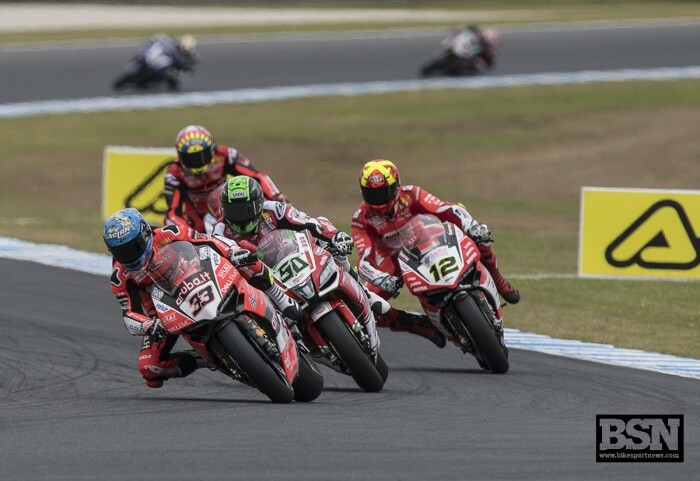 Aruba Ducati’s Marco Melandri bagged the double WorldSBK win at Phillip Island today with a 0.021s win over an ill Jonathan Rea in what was one of the best Superbike races of recent years - helped a little by mandatory pitstops. A tremendous fight up front saw reigning champion Rea head the charge from his front-row start, but only after Eugene Laverty had crashed out of a strong lead. Chaz Davies (Aruba Ducati) and Xavi Fores (Barni Ducati) blasted past on the main straight, on a day when the Ducatis had the top speed advantage on the green machines. A nine-rider scrap before the mandatory tyre change was thrilling for the fans and spectators at home, only dropping fast-charging Toprak Razgatlioglu (Kawasaki Puccetti) after eight laps. Fores, Rea and Michael van der Mark (Pata Yamaha) were the first to pit for tyres, leaving Davies and Marco Melandri out front, and Sykes up to third. Davies led the remaining top riders into the pits one lap later, but crashed at MG on his restart lap, to no score. Briefly, PJ Jacobsen (TripleM Honda) led the race before his pit stop and he would finish 14th. Daniel Falzon (Yamaha Racing Team Australia) was given a black flag for exceeding his number of maximum laps before he stopped for tyres. Rea set the best lap of the race to that point on lap 13, with a 1’31.004, until Melandri posted a 1’30.848 on lap 15 – new a lap record for the Italian. Melandri passed Sykes and ran him wide into the scary Doohan corner, with the race one winner making up the gap to Rea with relative ease. Rea pounced on Fores with three laps to go, Melandri going through on Fores soon after, with Sykes closing in all the way. Over the line for the penultimate lap Melandri passed Rea, only for Rea to go inside and slam the door on the Ducati to lead on the final lap. Melandri just made his final pass on the final straight in time to win by 0.021 seconds, with Fores third and only 0.304 seconds down. Sykes was fourth, Lowes fifth, Leon Camier (Red Bull Honda) sixth, van der Mark seventh - and just over three seconds from the race winner and first time Ducati double man Marco Melandri. A stunning start from Eugene Laverty (Milwaukee Aprilia) ended up with the Irish rider in the gravel after he had set the fastest lap of the first half of the race. He got going again to finish 15th, but two laps down. In the championship points, Melandri has a perfect 50, Sykes is second with 33, Rea third on 31 and Fores fourth on 29.